It has only taken a matter of months for 18-year old Marcus Rashford to break through the Manchester United and England squads, having scored on both club and country debuts. The Manchester United man has enjoyed a sublime run of form during the past 4 months, scoring 8 goals in 18 appearances. His amazing form has earned him a spot in the England squad for the upcoming Euro 2016 tournament in France. Let’s take a look at the teenager’s meteoric rise from academy football to national football. Louis Van Gaal had run out of attacking options, with Anthony Martial and Wayne Rooney both ruled out. Rashford stayed an unused substitute while Depay was the chosen striker. United won the match 1-2 with Depay scoring a goal and Marcus Rashford making his first breakthrough to the first team squad but unfortunately, was not picked to play on the day. Rashford was a late addition to the United starting lineup, with Anthony Martial picking up an injury during the pre-match training sessions. He was dumped upfront, marking his first-team debut in this UEFA Europa Round of 32 second leg tie against the Danish opposition. This night proved to be the defining moment of the youngster’s career, shooting him to stardom. Rashford netted 2 goals in the space of 12 minutes, helping the Red Devils overcome their first leg loss. His heroics made him Manchester United’s youngest ever goal scorer in European competitions – beating former record holder, George Best. A mere 3 days after a spectacular display in the Europa League, Marcus was provided with his first ever Barclays Premier League start, and he was faced with one of United’s fiercest rivals from London – Arsenal FC. The 18 year old displayed his talents once again, scoring a brace against the North London club in the space of just 3 minutes. He also played a key role in Ander Herrera’s match winning goal. Marcus Rashford had once again proved his doubters wrong, after media reported that Midtjylland was only a “small club”. Almost a month had passed by before Marcus could show off his immense talents again, this time coming in form of the Manchester Derby. The teenager made a start to the game and managed to disassemble the City defense and score his first Manchester Derby goal in just 16 minutes. His goal turned out to be the winner, and made him the youngest ever scorer in a Manchester Derby in the Premier League era – at just 18 years and 141 days old. Louis Van Gaal labelled the teenage sensation as a “real striker” during the post-match conference – as it was only a matter of time before he broke into the National squad. A week after his Derby day winner, the United striker was picked to lead the young Lions against an impressive Canadian side. This match was Rashford’s first and only appearance for his national side at this level. 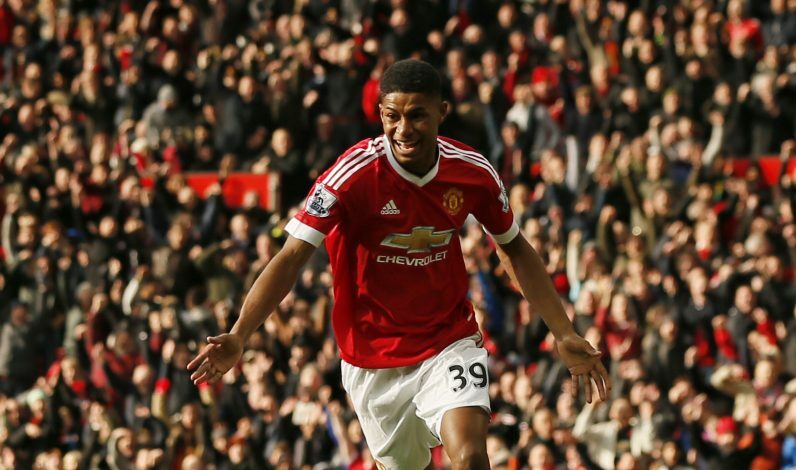 Marcus Rashford had made a start in almost every match since his breakthrough into the first team. He was recently taken off during United’s 3-0 loss at Tottenham and had been put in the starting squad for the FA Cup Replay against West Ham. The teenager soon displayed more of his brilliant run of form with an amazing strike into the top corner, effectively sending United through to the semi-final of the FA Cup. “It’s been a bit crazy really as everything happened at once, so it’s difficult to take in. “That worked in my favor as I didn’t really have time to think about. After being included in England’s provisional Euro 2016 squad, Marcus was given his debut for his National side. He was handed the No.9 shirt and took Daniel Sturridge’s place in the starting lineup. His rise to fame and unbelievable run of form continued as he smashed home his first England goal to mark an incredible start to his National career. The young starlet put to bed all rumors of a potential transfer by signing a brand new 4-year deal, with an option to extend a further year with the club. His wage had now been increased to a whopping £20,000-a-week – not bad for an 18-year-old. Roy Hodgson announced the final England squad for the upcoming Euro 2016 tournament and included the Manchester United youngster, alongside strikers Jamie Vardy, Wayne Rooney, Harry Kane, and Daniel Sturridge. In less than half a year, the youngster had completed his journey from club football to international football – a very impressive start to the young lad’s career. The youngster will definitely gain valuable experience in the upcoming tournament, and fully deserves to be where he is at the moment. His abrupt rise from the youth academy is an inspirational story for all young footballers. Although it seems that it’s all been going too fast for the youngster and he may not be able to cope with the pressure that the national team generally play with – England have not been the best in the world in recent years. The 18 year old will have a lot writing on him should Roy decide to play the teenager. But from the looks so far, we can only hope his form continues to rocket up as it has been with Manchester United. He is only behind Jamie Vardy in terms of form, with Rooney and Sturridge facing injury and morale problems. It will be interesting to see how Roy Hodgson manipulates his squad, and whether he will decide to give the young teenage sensation a chance. All we can hope for is that his sublime form continues.